Fifteen years after his sacking, Alan Bates, former postmaster of Craig-y-Don Post Office in Llandudno, North Wales, had his day in court. Alan was there to be cross-examined on his evidence as one of the Lead Claimants to the Common Issues trial, which is part of the wider Bates and others v Post Office group litigation action. Alan's evidence is 41 pages long. You should be able to read it here. The Post Office's QC, the extremely capable David Cavender started by agreeing Alan's dates as a Subpostmaster and then subsequent campaigner against the Post Office, suggesting that we were going to start talking about things a very long time ago, and memory couldn't necessarily be relied on for exact details. Alan said "I won’t remember all the detail but because they affected me they were of concern to me - and I recorded them at the time"
Alan hetn spent the rest of the morning being questioned on his Subpostmaster's contract. Alan has a reputation as a dogged, methodical, precise sort of fellow. Mr Cavender asked him about this element of his character. He suggested Alan was an experienced businessman who had worked on big projects and thrived on attention to detail. Alan accepted this characterisation. The QC then subjected Alan Bates to some relentless questioning about his purchase of the Craig-y-Don Post Office and retail business. In his written evidence, Alan maintained he did not see a full Subpostmasters' contract before he took over the branch. Mr Cavender found this incredible. Having painted a picture, which Alan accepted, of an experienced businessman who thrived on detail, how on earth could or would he take on a business without seeing the contract or discussing the nature of his liabilities on the business? Alan knocked this back, saying he didn't discuss the Subpostmaster's contract with his predecessor, because it was something he expected to discuss with the Post Office, and he said when he did sign a contract with the Post Office, he thought the three short documents and covering letter constituted the contract, and had no idea that there was another 144 page document called the Subpostmaster's contract which contained all the detail about his responsibilities if everything went wrong. The QC seemed to think this was ridiculous. He asked how Alan could possibly have gone into a business deal without seeing the contract which underpinned it. He then suggested that Alan was wrong and he did have the contract. Alan maintained he didn't. Then Alan was asked why, when he signed upwards of twenty documents on the day he took over the Post Office in the presence of a Post Office manager, he didn't read any of them. Hardly the mark of an attention to detail man said the QC. Alan said it was because he didn't think they were that important, he took what he was being told on trust and this was on the day he took over the Post Office. A lot of the time they were trying to serve customers. The QC then asks Alan why he said in his witness statement the Post Office never drew attention to section 12.12 of the Subpostmasters' contract when he had actually signed a document in 1999 in which the Post Office literally draws attention to that very clause. There is a beat and then the QC asked "Did you draft your own witness statement?" Alan collected himself to say the Subpostmasters' contract (as a specific 144 page document) was never discussed by the Post Office during his interview or on the day he took over the Post Office. He says his witness statement is his recollection of what he was told at the time. The QC put it to him again that he had been sent the Subpostmasters' contract as there is no way he would have entered into a contract with the Post Office without it. Alan said if he was sent the Subpostmasters' contract there is no way he would have signed it without sending it to his lawyer first for advice. Alan had a number of mysterious discrepancies with Horizon which he was frustrated at not being able to get to the bottom of. The QC pointed out he could do all that and put it into suspense. So why didn't he? Alan blustered a bit at this. The QC asked the same question again. 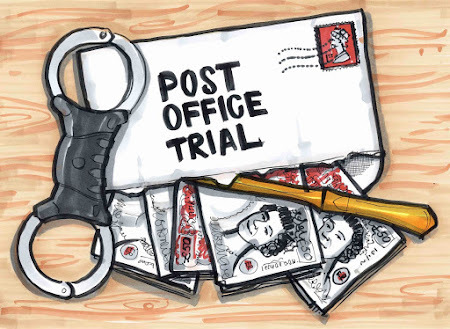 The judge then interjected to point out that the QC was ignoring parts of the Post Office's approach in the letters that they sent Alan which basically demanded payment. The QC admitted that this was, of course, the Post Office's preferred option - Alan just paying up. But he still had the option of putting it into suspense and didn't. Towards the end of the cross examination, the QC suggested that Alan had become a little fixated on Horizon to the extent he saw it as the source of all his problems and he's remained fixated ever since. In fact, the QC said it was quite conceivable the errors could have been down to him or his assistants. But, said the QC he did very little in the way of investigation into how losses were appearing in his branch before blaming Horizon. Alan said no - every time he looked at Horizon for a mistake he found it. A few minutes were spent on the quality of the training Alan got for Horizon ("sadly lacking in a major way"), and that was that. Then came Lead Claimant number 2 Pam Stubbs. I made a film about Pam in 2014 for the One Show - you can see it here (she's in the second of two films) which is just as well as I failed to get a photo of her outside court. Pam and her husband ran the Barkham Post Office near Wokingham in Berkshire for a total of 23 years. Pam's husband Martin ran the branch until his death to an aggressive form of cancer in 1999. The day after he died, Pam became Subpostmaster. 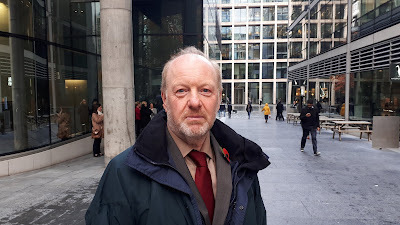 When Pam took to the witness box in court today, David Cavender started in the same way he started with Alan Bates, suggesting this was all a long time ago, we're talking about mundane events and it's likely that memories of that time will be fallible. Pam seemed circumspect and said her memory wasn't too bad. David Cavender: "We are talking about everyday events, not something like a car crash." PS: "If you're referring to the events of August 1999 it very much was like a car crash and I remember it vividly." DC: "I think you might be referring to your husband's death." David Cavender says he understands it must have been a very difficult time, but he is talking about mundane things like signing documents. PS: "Well let's see what documents you want to talk about and I'll see how well I remember them." Pam was asked if she understood that her husband was operating under a contract. Pam said she guessed he must be, but she never saw one or saw him consulting it or heard him talking about it. It transpires that the Post Office has no record of Martin Stubbs ever having signed a Subpostmaster contract. For such an important document the Subpostmasters' contract was beginning to assume the tantalising proportions of a snark. Thoughts turned to Pam's contract. DC: "You accept you were regulated by the SPMC (Subpostmasters' contract) for the purposes of this process." PS: "I assumed I would be taking over the branch on the same terms as my husband ran the branch. I don’t recall having seen a contract." Pam was questioned about her understanding of the agent (Subpostmaster)/principal (Post Office) relationship, though this line of questioning came to an abrupt end when Pam pointed out that for the first few months as Subpostmaster she was being taxed at source as an employee. This wasn't really helping the Post Office's argument that the Subpostmaster/Post Office relationship is in no way tortious or relational (see Day 1 blog post). The line of questioning was quickly dropped in favour of a discussion about contracts. Again. Pam was asked what she signed signing a contract the day she became Subpostmaster - she maintains she did not see a Subpostmaster contract for the entire time she was a Subpostmaster. A really long exchange about what sort of documents Pam signed on the day after her husband's death or some weeks later goes on for about half an hour before being abandoned. We eventually alight on Pam's suspension. "Were you surprised?" asked Mr Cavender. Pam said she was "Astounded, staggered" and "as upset as I've ever been by anything in my life." He asked if she ever thought she could be sacked without notice. "No. Not really" said Pam. The QC then asked why she didn't consult her contract to see if she could be suspended in the way she was. Pam told him it was a bit late by then, and she'd been locked out of her temporary Post Office without access to any of the documents. The QC then points out when she wrote her resignation letter, some months after her suspension she mentions that she is giving her three months notice. The QC suggests this means she had consulted her contract. Pam Stubbs is adamant she only put three months because the helpline told her they wouldn't let her Post Office be passed on to anyone else unless she gave three months notice. Are you sure you didn't have a contract then? asks the QC. Pam says no. And so ended the second day of the Common Issues trial in court 26 of the Rolls Building in London. The court will reconvene on Monday when the rest of Pam Stubbs' evidence will be heard.